9 years ago in xamarin android ~ read. I don’t know about you, but the main thing I’m interested in on any new mobile development platform for some reason, is LISTS. I think I’m so fixated on lists is because of the way the iPhone so successfully introduced the paradigm of list based navigation. Everything can be done in a series of lists (ok not really, but they are crucial to many apps!). 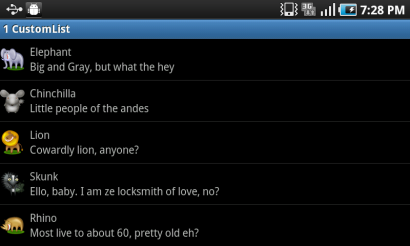 Naturally then, the first thing I sought out to do on MonoDroid was to create a list. Easy, piece of cake… If you want to create a boring old list with a single line of text for each item. This is no doubt, an important part of every developer’s Hello World development phase, but it doesn’t take long before you’re craving images, several text elements, and possibly even some checkboxes and/or buttons (easy there tiger). For every ListView in Android, there is a prince charming ListView Adapter to save the day. The most basic of examples which you’ve no doubt seen involve an ArrayAdapter of some sort, with the default Android.R.Layout.SimpleListItem or whatever it is called. BOOORING. What we need to do to make something exciting is create our own custom ListView Adapter. Now, you could use a SimpleAdapter to map fields to certain resource id’s of a layout, but if you look at a java example of this, ‘Simple’ quickly becomes a relative term. What I like to do is create my own adapter deriving from the BaseAdapter class (how fitting). Now for the sake of the demo, I create my own data inside the adapter, and of course nothing is stopping you from getting that data from a webservice, or somewhere more fashionable. The first thing to note is that I’m requiring an Activity object in the ctor. This really is only used to get the LayoutInflator for the given Activity so that we can inflate our row’s View later on, but it is important to have it. Next thing of interest is the overrides. All we really need to override is the Count property, GetItem method, GetItemId method, and GetView method. The last method (GetItemAtPosition) is my own addition so that I can read out the object for a given position elsewhere in the project (in this case, when a ListView.ItemClicked event is fired). Count is easy, just return your object list’s count (duh). GetItem and GetItemId I’m still not convinced are necessary, but I override them anyways and just return the position in each case. The only significance I know of so far with these properties is in some ListView events, the item Id is passed as an event arg. However, in these same events, we also get the item’s position, which is why I have the GetItemAtPosition method, so I can retrieve the relevant object for the event. I’d love to hear from anyone who knows more about why I might want to pay more attention to the GetItem and GetItemId methods. GetView is where the magic happens. Basically, I get the item for the given position first. Next, I determine if the convertView parameter is null or not, and inflate my CustomListItem’s layout into a usable View (LinearLayout to be specific). This is basically a way for us to reuse resources. Anyone familiar with MonoTouch and the Reusable UITableViewCell will feel right at home here. We could inflate the resource every time, but that would waste unnecessary resources. So, best practice here is to always reuse if the convertView is not null. Now then, with my LinearLayout instance, I can locate all of the views within that I want to assign information to, for the given row. As you can see in this case, I have an ImageView, and two TextView’s. Once I have found references to these, I can set their text and image. Finally, I can return the LinearLayout View that I’ve been working on for this row. That wasn’t so hard, was it? Last, but not least, we need to actually deal with our Activity that holds the ListView. Up until now we had just created the adapter that our ListView was going to use. Now we need to actually hook an adapta’ up. So you can see in my Activity’s OnCreate, I’m calling the base method (important), and then setting the activity’s content view to the layout xml that I showed you above. I’m also creating an instance of the CustomListAdapter I made earlier, and finding a reference to my ListView, so that I can set my ListView’s .Adapter property to the instance of the CustomListAdapter. As a bonus, I register the ItemClick event of my ListView, and in it, retrieve the item for the given position, from my CustomListAdapter, using the method I added to the adapter (GetItemPositionAt). I then display a Toast with the name of the Animal clicked.